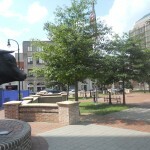 Within walking distance of YMCA, city and county government buildings, and downtown stores and restaurants. Over 65,000 square-feet of affordable office and retail space. Shared services such as conference rooms, break rooms, and office equipment.